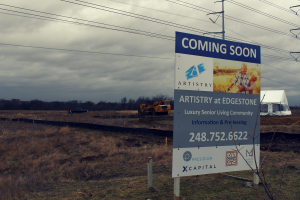 January 22, 2019 – Presidium, a diversified real estate investment and management firm, has broken ground on Artistry at Edgestone, the first senior living community of its kind to be developed in the City of Frisco, Texas. When complete in Summer 2020, the 188-unit community will be the only luxury age-restricted product in Frisco with freestanding independent living cottages that offer community members a heightened sense of privacy and ease the transition of moving from a single-family home. The conveniently-located 18-acre gated development has been designed to carefully balance the needs of today’s seniors who desire an active, maintenance-free lifestyle. “Presidium has taken a modern approach to providing state-of-the-art amenities that provide a greatly sought-after environment, all within close proximity to the plethora of local attractions Frisco has to offer,” said John Griggs, Co-CEO and Co-Founder of Presidium. Artistry at Edgestone’s community will feature many high-end amenities throughout, including multi-purpose clubrooms, a resort-style swimming pool, a fitness and wellness center, a library and cyber lounge, a media and game rooms, a hair salon, an arts and crafts center, pavilions, a bocce ball court, a walking trail, a dog park and a resident gardening area with shade structures. Edgestone’s residents will also have access to a full calendar of services and programs. “The spacious community was designed to offer residents an open environment, and with its prime location – being nestled within some of the most impressive parks and walking trails in the country, it is perfect for mature adults who enjoy the outdoors and wish to maintain an active lifestyle,” added Griggs. The development will consist of one three-story residential building with elevators and seven one-story bungalows with cottage units. The units will feature open floor plans with 9-9.5-foot ceilings, granite countertops and tile backsplashes, wood plank and ceramic tile flooring, energy-efficient appliances and light fixtures, washer and dryer connections, walk-in closets, and private patios and balconies. Additionally, this project is designed to achieve certification by National Green Building Standards (NGBS), verifying the campus’ high performance in six key areas: site design, resource efficiency, water efficiency, energy efficiency, indoor environmental quality, and building operations and maintenance. Located near Plano’s burgeoning Legacy West development, Artistry at Edgestone is in close proximity to more than $8-billion worth of commercial developments including The Star, The Gate, Ward Park, Frisco Town Square, Stonebriar Centre and Frisco Station. From humble beginnings in 2003, Presidium has grown to over 300 team members and over 70 assets under management, valued in excess of $1.5 billion. Presidium’s team is distinguished by the diversity, depth and character of its people. We represent a spectrum of disciplines including law, finance, government, accounting, acquisitions, asset management, special servicing, property management, public-private partnerships, development and construction.